Artist’s conception of NASA’s Lunar Reconnaissance Orbiter above the Moon. The Cosmic Ray Telescope for the Effects of Radiation (CRaTER) instrument is visible in the center of the image at the bottom left corner of the spacecraft. Image courtesy of NASA. 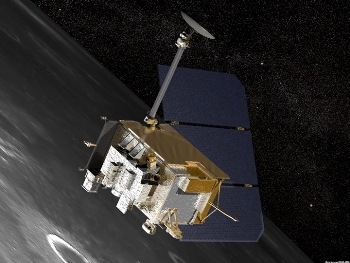 Since LRO’s launch in 2009, the CRaTER instrument has been measuring energetic charged particles—particles that can travel at nearly the speed of light and may cause detrimental health effects—from galactic cosmic rays and solar particle events. Fortunately, Earth’s thick atmosphere and strong magnetic field provide adequate shielding against these dangerous high-energy particles. For more on the CRaTER instrument, visit http://crater.sr.unh.edu/ and for the LRO mission visit http://lunar.gsfc.nasa.gov/mission.html.